Sail into tiny harbors and hidden bays where only yachts can go. Explore in small groups that take you behind the scenes or off the beaten track. 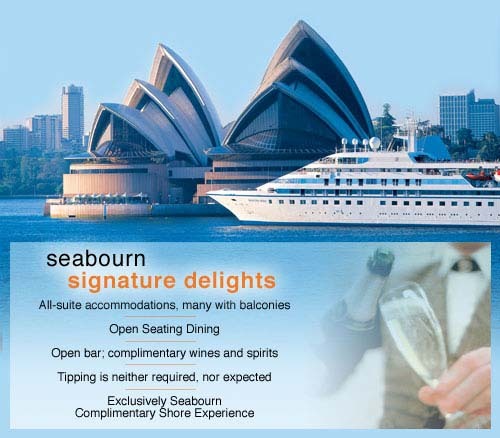 This is yachting with Seabourn. Travel that is inntimate, close up and authentic. Sail with us and experience the yachting life of Seabourn for yourself with our incredible values in Europe this Winter. * All fares are in U.S. dollars, cruise-only, per guest, double occupancy, subject to availability and valid only for residents of the Americas. Some suite categories may not be available. Government fees of $26.93 to $606.98 per person are not included. Fares are not combinable with any other offer, vary by sailing date, are capacity controlled, are subject to change without prior notice. Seabourn reserves the right to charge a fuel supplement for all guests, without prior notice, if the NYMEX oil price exceeds $70.00 per barrel, and may collect such a supplement even if the cruise fare has been paid in full. Certain restrictions apply. Information herein is accurate at time of printing. Seabourn reserves the right to correct errors. Ships’ registry: Bahamas ©2010 Seabourn.